Be sure to take advantage of our special offers on vending machines for your office. Our Kenco hot drink vending machine range has something for everyone. 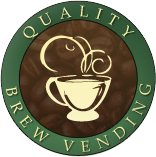 All Hot drinks / coffee machines will be installed on ‘FREE VEND’ for You and Your staff to enjoy a free refreshment service on behalf of Quality Brew Vending for 1 week from installation date. To take advantage of our welcome gift, please call us now to arrange a free site survey and installation date. Just fill out the form below and one of our team will call you back free of charge.